TUGAIT is one of the most important community events in Europe, many speakers across all countries join the conference and most of them are Microsoft MVPs. The community events are the higher expression of the passion for technologies because organized just for a pure scope of sharing knowledge and experience. This year I will present 2 sessions, here the full agenda, one focused to Microsoft Azure, the second focused more to the development aspect. how I see EventHubs, all the technologies normally involved with it and how to use it in real scenario. For this session I prepared a very interesting demo which involve, EventHubs, Stream Analytics, Service Bus, Data Factory, Data Catalog, Power Bi, Logic App, On premise integration. I will explain how to manage EventHubs, the most important challenges in a scenario using it and how to solve them. We will compare EventHubs with the other technologies and how to use it in different scenarios like IoT , event driven integration, broadcasting messaging and more. In the second session, How to face the integration challenges using the open source, I will present how to integrate technologies today using all the technologies available, the differences between them and the best approaches to use. I will present the most interesting challenges about hybrid integration and messaging scenarios using Cloud and on premise options. We will examine all the technologies stack available and how to combine them to solve integration scenarios like hybrid data ingestion, big data moving, high loading, reliable messaging and more. We will see how to manipulate specific technologies stacks and how to use them in different ways to save cost and to obtain first class solutions. I’m very excited because TUGAIT is a very important event and it’s a great opportunity to share your personal experience with a lot of people, have a lot of fun in a perfect community spirit. 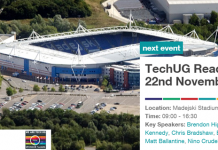 Next event – TechUG UK 2017 – November 22th – Reading! Next Event – WPC 2017 November 28/29/30 – Milan!